OAKLAND, Calif. (AP) The ”M-V-P!” chants reigned down, and Stephen Curry played every bit like one yet again. Mouthpiece dangling and shots dropping. He has had so many brilliant back-and-forths with Kyrie Irving in recent years, and this one will surely be added to that list among the best. 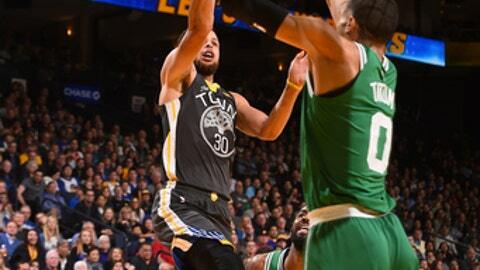 Curry scored 49 points with 13 of those over the final 1:42 and hit eight 3-pointers, lifting the Golden State Warriors past the Boston Celtics 109-105 on Saturday night in what is already being hyped as a potential NBA Finals matchup come June. Irving scored 37 points on 13-for-18 shooting with five 3s, but Boston failed to build momentum from a win at the Clippers on Wednesday night and lost for the fifth time in six games. The NBA’s top teams from their respective conferences put on quite an entertaining show. Curry made a go-ahead 3 with 1:42 to play, scored on a driving layup the next time down before eight late free throws. He also made three of his 3s over the final 4:20 of the third quarter for the Warriors, who had lost the last two matchups to the Celtics and two in a row at home. The Warriors fell 92-88 at Boston on Nov. 16 in which they squandered a 17-point lead. Kevin Durant added 20 points and nine rebounds for the Warriors, who haven’t lost to the same Eastern Conference opponent twice in the same season during fourth-year coach Steve Kerr’s tenure. Draymond Green had 15 points, 11 rebounds and five assists. Curry’s 3-pointer with 4:20 left in the third put Golden State up 70-63, he hit another at the 2:52 mark then connected once more at 2:12 as Golden State grabbed momentum heading into the final period up 80-73. The two-time NBA MVP scored 18 points in the third, shot 16 for 24 and 8 of 13 from long range while notching his second 40-point game of the season and 29th of his career in the regular season. Fans chanted ”M-V-P!” as he made two free throws with 43 seconds left, two more at the 10.3 mark, another pair with 6.9 seconds left and two more at 1.6. Plenty familiar with Golden State from three straight Finals matchups with the Cavaliers, he hit his first seven shots with three 3-pointers while Jaylen Brown converted his first four field goals including two 3s. Boston built a 34-24 lead late in the opening quarter and stayed ahead by 10 going into the second. He didn’t miss his first shot until a driving floater 4:16 before halftime. Irving too appreciates the push from Curry. Curry isn’t about to make a bold prediction about Finals time. He learned that lesson already. Coach Brad Stevens still doesn’t expect Gordon Hayward to play again for Boston this season as he recovers from a gruesome broken left ankle suffered early in his Celtics debut last October. Hayward hasn’t lost his shooting stroke as he rehabs. Kerr has been so impressed with the Celtics’ resiliency without the star guard. Celtics: Second-year F Brown, who played collegiately at nearby Cal, scored 20 points. Durant hit a 3 from the top of the arc over Brown midway through the first quarter. … Boston shot just 32.9 percent in beating the Warriors last time, including 7 of 32 from deep, but made 14 of 27 3s on Saturday. Warriors: Curry has made at least five 3-pointers in five straight games, one off the NBA record. ”I’m shooting 30 3s next game,” he cracked. … G Patrick McCaw missed his second straight game but said he is improving from a strained mid-back and hopes a few days before the next game will give him time to be ready. … Rookie F Jordan Bell missed his fourth straight game with left ankle inflammation. … C Damian Jones was recalled from the G League Santa Cruz Warriors, who will play their second ever game at Oracle on Sunday night against the Austin Spurs. So Jones could play again in Oakland on Sunday if sent down again. Celtics: At Denver on Monday to conclude a four-game road trip. Warriors: At Utah on Tuesday looking for a fourth straight road win in the series.